With the internet marketing agency HEWO Simplessus has fully and completely won over another customer. 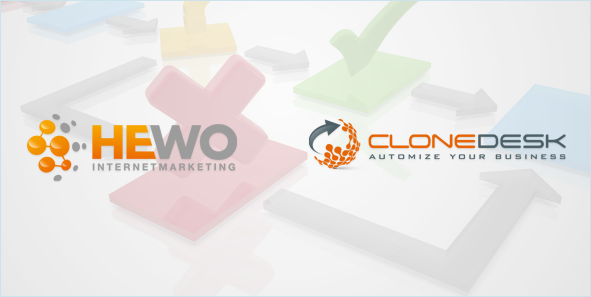 With the help of the software solution developed by us under the name CloneDesk the employees of HEWO are now able to perform the most varied of processes. With the internet marketing agency HEWO Simplessus has fully and completely won over another customer. With the help of the software solution developed by us under the name CloneDesk the employees of HEWO are now able to perform the most varied of processes. For this a web based online order administration was implemented with extensive task and process management as well as time tracking and the respective reporting. The workflow management software also works as a customer extranet that with the appropriate access data offers a real time view of the order status. So HEWO's customers can check at any time to what extent their orders have already been processed. Overall our solution thus not only simplifies the flow of daily work, but at the same time increases the transparency and thereby creates even more satisfied customers HEWO. Why it was necessary to develop software for so-called business process management, is explained by Hendrik Henze, business manager of HEWO. "We started our new website at the beginning of this year and wanted to also offer our customers a true added value in order management. None of the workflow solutions established in the marketplace were flexible enough for our specific needs, were overall too expensive with the customizing or were much too slow and cumbersome to use. We work completely online and therefore page display in all work steps depend on milliseconds. So we decided to have custom software developed." Together with HEWO the rough requirements were worked out in an agile development process. Overall one aspect mainly mattered: "Our customers were to receive even more control over their orders and the tasks performed by us," explained Henze. As workflow management software CloneDesk fully and completely fulfills these demands: Customers are actively involved in all processes and track in real time how the individual tasks are completed for them. "The first feedback we have received so far has been overwhelmingly positive," reports Christian Wolf, business manager of HEWO. "At HEWO the software is being used to optimize process management and to better control the internal workflow. In addition other online agencies have the opportunity to lease this solution for business process management from HEWO as a SaaS solution and to display their own processes with it." Those who see the varied options of the software for the first time, would likely suspect that the solution was created within a short period of time. If you are also interested in implementing your processes via a current software solution for desktop, tablet and smartphones, talk to us. * What is 8 - 5 ?